BioRenew HGH Plus IGF-1 uses homeopathic methods which means any ingredients they do are so diluted down to the point that they may not even be there at all in the first place. 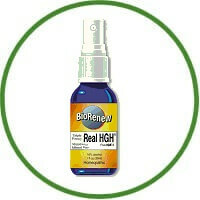 BioRenew Real HGH Plus IGF-1 claims that you can reduce fat and cellulite, build lean muscle mass, and otherwise get the benefits in energy, sexual performance, skin, hair, nails, brain function, and sleep among other things that you need by using a homeopathic approach to HGH supplementation and growth as a whole. They claim that you can even protect individual cells to improve your body as a whole. This formula was created by a large company that has sold hundreds of different products. They aren’t disappearing any time soon as CalComp Nutrition. They also use various ingredients that are interesting, some of which could mimic the effects of HGH. BioRenew HGH Plus IGF-1 uses homeopathic methods which means any ingredients they do are so diluted down to the point that they may not even be there at all in the first place. This being said, they claim to use real HGH as if that’s a good thing. It’s illegal and dangerous to the health of the common consumer, even in those small or almost nonexistent amounts. We would not recommend using BioRenew Real HGH Plus IGF-1. It does not give you the results you want, and it does not have any real benefits. BioRenew Real HGH Plus IGF-1 doesn’t have any validity to it, and frankly, it’s one of those homeopathic and “real HGH” products that you should always watch out for.